This salmon will knock your socks off! 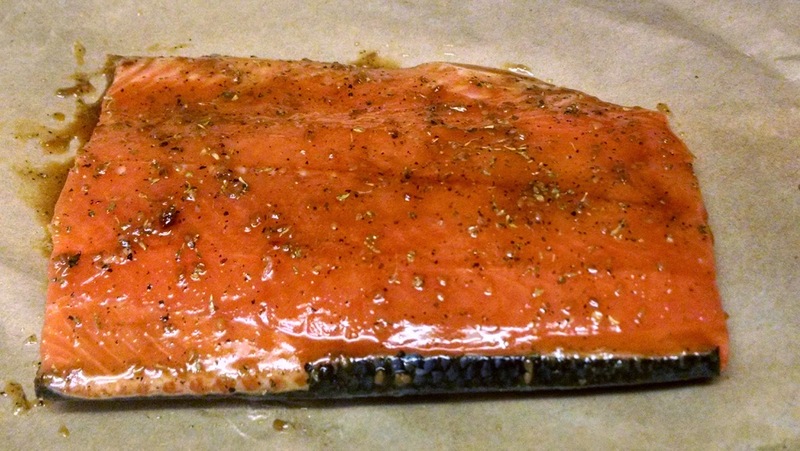 Yup, simple, satisfying, and spectacular salmon. Of all the salmon we have cooked, which we try to have at least once a week, this was one of the best adaptions that we have executed to date. 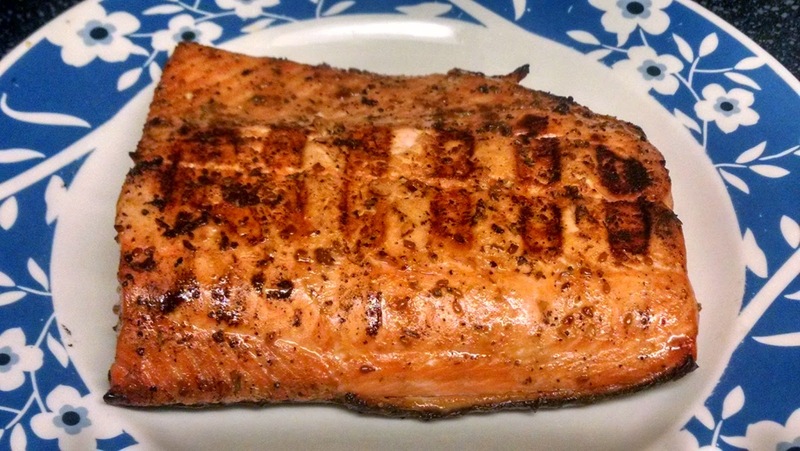 Salmon is rich, has tons of body, and can really take on a lot of seasonings. 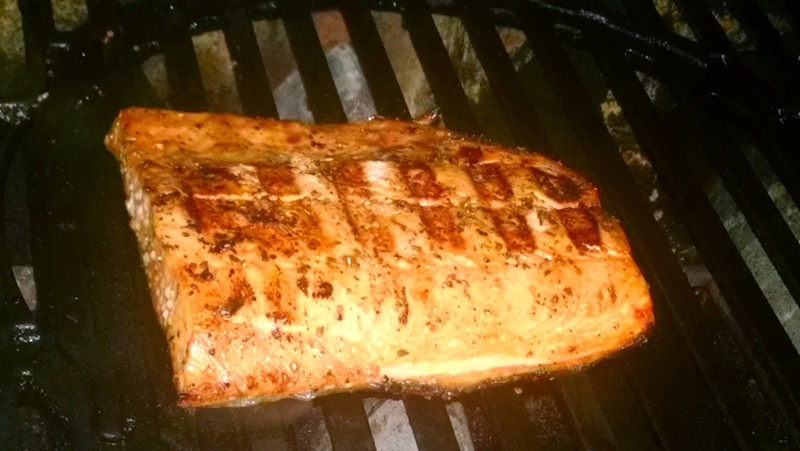 This salmon features a light teriyaki glaze with some added twists to make it my own. I am not ashamed to say that grabbing a bottle of soy or Teriyaki sauce from the store in order to save yourself a little time cooking is something I am all for — that way you can have a little more time to enjoy the important things in life. As I have stated, I am a big proponent for trying to make as much as you can from home but I have nothing against the benefits of what is available in the store. The only downside to using what you can find in the store is that some store bought sauces tend to be overpowering and detract from the flavor you are trying to enhance. The great news is there are very simple, easy, and clever ways to fix that. This all began at our local fish counter at our favorite store, where we saw all kinds of pre-marinated fish and various quick dinner options, as well as the fresh salmon we usually buy. We eyed our potential purchase warily as we were unsure of a marinating a strong flavored fish that tastes so good on its own. However, we had recently discovered that some of the combinations from a marinated fish or protein (no matter how strange they may sound) delivered great flavor. These flavor profiles included a variety of options, such as orange Dijon, or lemon and rosemary herb. Sound good, right? You’re right about that — because these marinades and sauces were perfectly paired combos with a number of different fish, including salmon. Unfortunately if a marinade too strong flavor-wise for the protein you’re working with, it is very easy to lose the flavor entirely as your meal is overwhelmed by the salt, the spice level, or other elements in the marinade. This can result in the fish or protein being over-saturated with the flavors of the marinade, such as orange and mustard, leaving your unable to enjoy the fish or anything else you might serve with it. That would be a terrible marinade experience! This post is meant to help you see what you can do to resolve this dilemma. The key is to remember you don’t have to use a huge amount of the strong flavored marinades, and sauces from a jar when working to develop your own Orange Dijon or an Asian inspired fish flavor profile — you’re not required to use only what is in those jars. So, we found this glaze we liked and because it was something that was used already to marinate various fishes and meat by the meat department, which often helped the store move the last few fillets of fish or a few extra chicken breasts the staff will marinate the items they need to sell in order to make room for something else. The good news is that this marinade and others like it are readily available at the fish counter and meat department for you to sample first before committing to using it on your fish, pork, beef, etc., to see if it would be worth buying rather than spending the money on a jar of sauce that you know you probably won’t like. Also, in a lot of large grocery stores, we frequent Whole Foods and New Seasons, you can buy sample size containers for little to no cost if you ask the grocery clerk what you’re using it for or what you are trying to do. Now that we had the sauce, it was time to play “Let’s Make a New Glaze.” You can do this a lot of ways, for us, we went with simple additions, including olive oil, dried basil and oregano, a little fresh ground pepper, and lime juice. The oil is a great way to thin your glaze if it appears to thick. Adding dried herbs can really enhance the flavors of the fish in this case, but dried herbs work in anything! We admittedly love black pepper, not only because nothing beats fresh ground pepper, but it can really help if you are trying to counterbalance salt or richness in any dish. As you can imagine, the lime juice is used for the same reasons, to give the fish a perfect note of citrus undertone and to provide a perfect counterpoint to the salt, balancing these flavors exceptionally well. Again, it will help keep your glaze thinner and easier to apply by using the oil & lime juice into the marinade. Here is the thinned out glaze with olive oil, pepper, dried basil and oregano, and a little lime juice. In case you are wondering why I didn’t mention salt that is because the teriyaki has plenty of salt already and likely salt won’t be need. If you think you do need more salt, first add only a small amount of salt as it possibly could grow too salty very quickly. Be, sure to taste your glaze before you apply it to the fish, and if the seasonings are too strong or not strong enough, adjust as needed before applying to salmon. Remember, you can always add, but subtracting in this case gets difficult. Good Evening, This is your Captain, speaking from the Grill Deck. “We are cruising at about 400 hundred degrees for about 15-20 minutes. As we make our descent, please remember to check your fish as carryover heat will be applied and your fish will continue to cook until its arrival to the plate. We thank you for flying Salmon Airlines, and thank you for letting us serve you at medium rare. Hope you enjoy this great dish!